Abu Dhabi, officially, the Emirate of Abu Dhabi (Arabic: إمارة أبو ظبيّ), (literally Father of Gazelle), is one of seven emirates that constitute the United Arab Emirates (UAE) in the eastern Arabian Peninsula. "Abu Dhabi" also refers to that emirate's main city, which is often called "Abu Dhabi City" to distinguish it from the emirate. 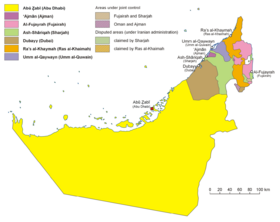 The modern emirate of Abu Dhabi was created with the formation of the United Arab Emirates in 1971. It shares legal, political, military, and economic functions with the other emirates within a federal framework, although each emirate has jurisdiction over some functions such as civic law enforcement and provision and upkeep of local facilities. It is the largest emirate by area, and second-largest by population, after Dubai, accounting for more than three-fourths of the area of the entire federation. With Dubai, it is one of only two emirates to possess veto power over critical matters of national importance in the UAE. The Al Nahyan branch of Al Falahi is the ruling family in Abu Dhabi, while the Al Maktoum, a branch of Al Falasi, rules Dubai. Both stem from Bani Yas, which has an additional 13 main branches. The discovery of petroleum reserves in 1958, along with foreign investment, has given Abu Dhabi the third highest GDP per capita in the world, following Luxembourg and Norway. Rapid modernization and internal development has followed, though the emirate's leaders have also instituted a policy of assisting other emirates, Arab nations and developing nations in need. The emirate of Abu Dhabi is located in the oil-rich and strategic United Arab Emirates and is an active member of the Gulf Co-operation Council (GCC). It borders with the Kingdom of Saudi Arabia to its south and the Sultanate of Oman to its east. The emirate borders the emirate of Dubai to its northeast, surrounding half that state's territory, and has a short frontier with Al-Shariqah. In the north is the Persian Gulf. With an area of 28,210 square miles (73,060 sq km) it is unquestionably the largest of the UAE's seven constituent emirates, covering in excess of 75 percent of the entire country. The emirate has oil rich fields, both onshore and in the Persian Gulf. Along with Dubai, it leads the UAE in prosperity. Abu Dhabi has 280 miles (450 km) of coastline on the the Persian Gulf. The coast is somewhat desolate, with many areas of salt marsh. There are numerous offshore islands. The emirate's main city, also called Abu Dhabi (with "city" often added to distinguish the two) is located on one of these islands, less than .25 kilometers from the mainland and joined to the mainland by the Maqta and Mussafah bridges. 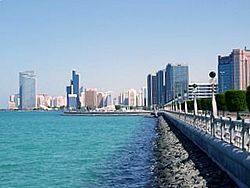 Most of Abu Dhabi city is located on the island itself, but it has many suburbs on the mainland, such as the Khalifa Cities, Between Two Bridges, Mussafah Residential and more. 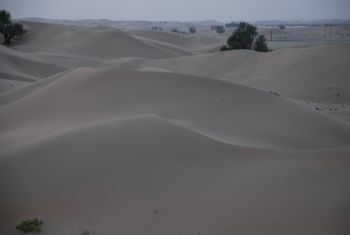 The emirate has a sunny climate, though the summer months of June through September are generally hot and humid with temperatures averaging above 40°C (110°F). During this time, sandstorms also occur intermittently, in some cases reducing visibility down to a few meters. The weather is usually pleasant from October to May. January to February is cooler and may require the use of a light jacket. This period also sees dense fog on some days. The oasis city of Al Ain on the Oman border, regularly records the highest summer temperatures in the country, however the dry desert air and cooler evenings make it a traditional retreat from the intense summer heat and year round humidity of the capital city. Parts of Abu Dhabi were settled as early as the third millennium B.C.E. and its early history fits the nomadic herding and fishing pattern typical of the broader region. Modern Abu Dhabi traces its origins to the rise of an important tribal confederation, the Bani Yas, in the late eighteenth century, which also assumed control of Dubai. In the nineteenth century the Dubai and Abu Dhabi branches parted ways. The Al Nahyan branch of Al Falahi is the ruling family in Abu Dhabi, while the Al Maktoum, a branch of Al Falasi, rules Dubai. Both stem from Bani Yas, which has an additional 13 main branches. Into the mid-twentieth century, the economy of Abu Dhabi continued to be sustained mainly by camel herding, production of dates and vegetables at the inland oases of Al Ain and Liwa, and fishing and pearl diving off the coast of Abu Dhabi city, which was occupied mainly during the summer months. Most dwellings in Abu Dhabi city were, at this time, constructed of palm fronds (barasti), with the wealthier families occupying mud huts. The growth of the cultured pearl industry in the first half of the twentieth century created hardship for residents of Abu Dhabi since natural pearls represented the largest export and main source of cash earnings. With the announcement by the United Kingdom in 1968 that it would withdraw from the Persian Gulf area by 1971, Sheikh Zayed became the main driving force behind the formation of the United Arab Emirates. Together with the other Trucial States, Bahrain, and Qatar, Abu Dhabi negotiated the formation of a nine-member federation. However, Bahrain and Qatar both went on to separate independent status. The United Arab Emirates came into being with seven states, with Abu Dhabi becoming a leading member. Abu Dhabi city became the provisional capital of the UAE; its status was extended several times until it was made the permanent national capital in the early 1990s. Oil wealth continued to flow to the area and traditional mud-brick huts were rapidly replaced with banks, boutiques, and modern high-rises. 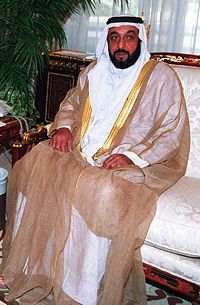 Sheikh Khalifa bin Zayed Al Nahyan is the hereditary ruler of Abu Dhabi. He is the son of Sheikh Zayed Al Nahyan, the first president of the United Arab Emirates. When the UAE was formed in 1971, the rulers of the individual emirates agreed upon and formed a system that would utilize modern administration, yet retain the traditional forms of government. This has allowed a distinct national identity to form, through consolidation of their federal status. The country enjoys an enviable degree of political stability. The traditional form of tribal administration is, in a sense, a form of direct democracy, as the ruler can stay in power only as long as he is able to retain the support of the people. An unwritten but strong principle within the traditional rule is that the people should have free access to their sheik. He is to hold frequent and open councils, allowing fellow tribesmen to voice their opinions. Rapid modernization, enormous strides in education, and the influx of a large foreign population have changed society but have not altered the traditional political system. Under the provisional constitution of 1971, each emirate reserves considerable powers, including control over mineral rights (notably oil) and revenues. In this milieu, federal powers have developed slowly. Each emirate also has representatives on the Federal National Council (FNC), the number of which is determined on the basis of their population. Abu Dhabi's own central governing organ, the Executive Council, is chaired by the Crown Prince, Sheikh Mohammed bin Zayed Al Nahyan. Under the executive council are a number of separate departments, equivalent to ministries. A number of autonomous agencies, such as the Environmental Agency also exist, with clearly specified powers. The emirate is divided into two regions, the Western Region and the Eastern Region, headed by Ruler's Representatives, and there is also a Ruler's Representative on the important oil terminal island of Das. The main cities, Abu Dhabi and Al Ain, are administered by municipalities, each of which has a nominated municipal council, these coming under the Department of Municipalities and Agriculture, while a new municipal authority has been created for the Western Region. The federal system of government includes a Supreme Council, a Cabinet, or Council of Ministers, a parliamentary body, the Federal National Council, and an independent judiciary, at the apex of which is the Federal Supreme Court. During their initial discussions on forming a federation, the rulers of the seven emirates agreed that each of them would be a member of a Supreme Council, the top policy-making body in the new state and that they would elect a President and a Vice President from among their number, to serve for a five-year, renewable, term of office. Abu Dhabi's representatives in the national government are Supreme Council Member—HH President Sheikh Khalifa bin Zayed Al Nahyan, Ruler of Abu Dhabi; and Crown Princes—HH General Sheikh Mohammed bin Zayed Al Nahyan, Crown Prince of Abu Dhabi and Deputy Supreme Commander of the UAE Armed Forces, Chairman of Abu Dhabi Executive Council. Although unofficial, the presidency of UAE is in fact hereditary to the Al-Nahyan clan of Abu Dhabi, and the premiership is hereditary to the Al-Maktoom clan of Dubai. The supreme council also elects the Council of Ministers. 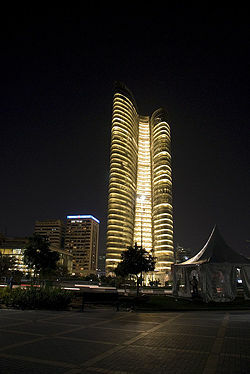 Abu Dhabi Investment Authority Tower (ADIA) at night. Abu Dhabi is the wealthiest emirate of the UAE in terms of Gross Domestic Product (GDP) and per capita income. Abu Dhabi's economic base rests heavily on crude-oil production. Petroleum was discovered in 1958 at the submarine field of Umm al-Shayf, about 75 miles offshore. Additional offshore fields are at the Ruqq Al-Zukum (Zukum shoal, northwest of Abu Dhabi city) and connected by submarine pipeline to Das Island, and at Umm al-Dalkh, north of Abu Dhabi town. Principal onshore production is from the Murban and Bu Hasa fields, the centers of which are in the central part of the state, 25 to 40 miles from the coast. It is estimated that 10 percent of the world's oil reserves are in Abu Dhabi. Abu Dhabi plays a large role in the world economy. Its sovereign wealth fund is the world's wealthiest sovereign fund, in terms of total asset value. The Abu Dhabi Investment Authority (ADIA) is a government investment company, with an estimated $875 billion in assets. The ADIA was established in 1976 by Sheikh Zayed bin Sultan Al Nahyan. The goal was to invest the emirate's surpluses across various asset classes, with low risk. At the time it was novel for a government to invest its reserves in anything other than gold or short-term credit. Even today, investment in short-term paper remains the strategy for the vast majority of countries. Today ADIA invests in all international markets—equities, fixed income, real estate, private equity and alternatives, such as hedge funds and commodity trading advisers. Its global portfolio is broken down into sub-funds covering a specific asset class. Each asset class has its own fund managers and in-house analysts covering it. Combined revenues from both oil royalties and investments has allowed for a series of large-scale ventures on construction and cultural development projects, designed to promote tourism. In addition to such internal development, the emirate has lent some of its wealth to less prosperous emirates, other Arab countries, as well as to developing countries. The majority of the inhabitants of Abu Dhabi are expatriate workers and professionals from India, Pakistan, Egypt, Bangladesh, the Philippines, United Kingdom, and elsewhere. Both English and Urdu are widely spoken. The native-born population are Arabic-speaking Gulf Arabs who are part of a clan-based society. The Al Nahyan family, part of the al-Falah branch of the Bani Yas tribe, rules the emirate and has a central place in society. Abu Dhabi is home to a number of cultural institutions including the Cultural Foundation and the National Theater. The Cultural foundation is home to the UAE Public Library and Cultural Center. Various cultural societies such as the Abu Dhabi Classical Music Society have a strong and visible following in the city. Progress on the creation of a major "up-scale cultural district" on Abu Dhabi's Saadiyat Island has begun with the groundwork for a Guggenheim Museum. The Frank Gehry designed museum will "be a preeminent platform for contemporary art and culture." Upon completion, it is expected to be the largest exponent of the prestigious Guggenheim Museums and will be "a catalyst for scholarship in a variety of fields, chief among them the history of art in the Middle East in the 20th and 21st centuries." The island development will also include museums for classical art and performing arts centers among other state-of-the-art cultural facilities. Abu Dhabi city is the capital and second most populous city in the UAE, after Dubai city. It is also the seat of government of the emirate of Abu Dhabi. The city lies on a T-shaped island jutting into the Persian Gulf from the central western coast. Planned in the 1970s, for an estimated maximum population of 600,000, it has far outgrown that with an estimated population in 2008 of one million. In accordance with what was considered to be ideal urban planning at the time, the city has wide grid-pattern roads, and high-density tower blocks. A modern city with broad boulevards, tall office and apartment buildings, it is also known throughout the region for its greenery; the former desert strip today includes numerous parks and gardens. Al Ain is the fourth largest city in the UAE, with a population of 421,948 (2005 estimate). The city is directly adjacent to the border with Oman. The freeways connecting Al Ain, Abu Dhabi city and Dubai city form a geographic triangle in the center of the country, each city roughly 150 kilometers from the other two. The area, historically known as the Buraimi Oasis, has been continuously inhabited for more than 4,000 years and Al Ain is considered central to the cultural heritage of the country. It is the birthplace of Shaikh Zayed bin Sultan Al Nahyan, the first president of the United Arab Emirates. Today the name Buraimi refers to the Omani town whose urban area merges with that of Al Ain. Until September 14, 2006, Al Ain and Buraimi enjoyed an open border and functioned as one. There are numerous underground water springs in the area, which explain its attractiveness as an area of settlement. Traces of its traditional past remain, including camel racing and breeding. The ancient falaj system of irrigation is still in use in some areas distributing underground water by a network of tunnels emerging eventually into open channels whose flow can be directed and regulated. ↑ 1.0 1.1 1.2 1.3 Encyclopædia Britannica Online, Abu Dhabi Retrieved April 28, 2018. ↑ Mohammed Al Fahim, From Rags to Riches: A Story of Abu Dhabi (London: London Centre of Arab Studies, 1995, ISBN 1900404001). ↑ 3.0 3.1 3.2 3.3 The political system The Official Portal of the UAE Government. Retrieved April 28, 2018. ↑ Asset-backed insecurity The Economist Newspaper Limited, January 17, 2008. Retrieved April 28, 2018. ↑ Solomon R. Guggenheim Foundation, Abu Dhabi About Us. Retrieved May 16, 2018. Peterson, J. E. "The United Arab Emirates: economic vibrancy and US interests." Asian Affairs 34(2) (2003): 137-142. United States Library of Congress, Country Studies. Executive and Legislative Branches. Retrieved May 16, 2018. History of "Abu Dhabi (emirate)"
This page was last modified on 16 May 2018, at 21:17.